Between Whitehorse and Kluane Lake, you should make an overnight stop in the beautiful Village of Haines Junction. 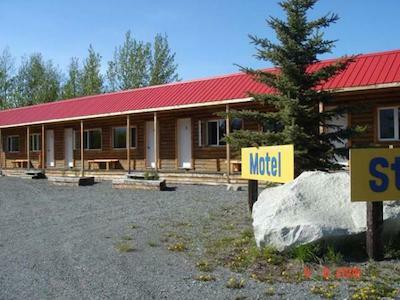 Here you'll find the cozy and comfortable Stardust Motel with 6 very clean non-smoking rooms, Satellite TV, private bath/WC with hair dryer, coffee maker etc. We are out of town (1km) in a nice and quiet neighborhood with a gorgeous view of the St. Elias Mountains in the world famous Kluane National Park.